This is the second part of a two part follow up on the Kinder Morgan investment thesis [Source] where we estimated Kinder Morgan Inc. (KMI), had the potential for attractive returns in a three to five year time frame. In Part I [Source] we take a closer look at KMI’s distribution and the company’s guidance for growth. Here, we look closer at the benefits from the lower cost of capital as a result of the consolidation and the debt incurred. The goal is to address questions that seem to be on some investors’ minds and determine if our investment thesis is on track or needs adjustment. Kinder Morgan’s current 6.2% distribution yield supported by stable cash flows and a wide moat is attractive, but the expected returns in the investment thesis are driven more by the growth of the distribution. As the distribution increases the share price should increase providing an attractive total return. The sector’s secular growth story should facilitate KMI’s growth plans as the largest participant in the sector. What seems unappreciated though is the increased opportunity set available due to the significantly lowered cost of capital resulting from the consolidation of KMI’s publicly traded entities in late 2014. Kinder Morgan’s significantly lowered its cost of capital with the consolidation of their four public companies into one. The cost of capital is the cost of the debt and equity raised from investors, about 50% each in KMI’s case, to finance the business. This has yet to be fully recognized. When coupled with the strong underlying industry growth it forms support for the investment thesis, and I’m sure, management’s distribution guidance. This lower cost of capital enables the company to either increase the profit margin at a given rate of return on new investments, or to become more competitive, expand faster by undertaking more investments, but accepting a lower return on the investment offset with the lower cost of capital to maintain the same profit margin. Capturing more than their proportionate share of the midstream growth opportunities were undoubtedly on KMI managements’ mind when they decided to consolidate. Incentive Distribution Rights (IDRs) are widely used in the MPL partnership structures. IDRs entitle the general partner to an increasing share of distributable cash flow from the limited partners. This arrangement incentivize the general partner to increase distributable cash flow for the limited partners and further aligns their interests. As the MLP increases its distribution rate, the general partner’s distribution grows at an even faster rate, generally up to 50% of the limited partner’s distribution. This incentive split for the general partner works well early on but can also make them a victim of their own success later. As the incentive increases it also increases the cost of capital (and hurdle rate) for the limited partner slowing the growth of the MLP. Kinder Morgan’s consolidation simplified their structure with one equity base (the KMI’s shareholders), one dividend policy, one corporate credit rating, eliminated the structural subordination discussed later, and eliminated the IDR’s. By eliminating the general partner/limited partner relationship the IDR’s disappear. KMP was one of KMI’s major operating partnerships that made a lot of midstream capital investments. 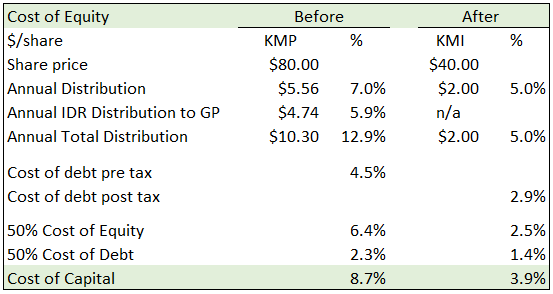 The table below shows how the consolidation of KMP into KMI, who will now make those investments, significantly lowered the cost of capital for the investments. The cost of capital is also referred to as the hurdle rate because projects must have higher returns than the hurdle rate to be profitable. Prior to the consolidation, the hurdle rate was about 9% pre-tax at KMP (the KMP partnership did not pay federal income taxes, the partners did). The new cost of capital is now about 4% after-tax, a huge reduction in any capital intensive industry and it could not come at a better time with the secular industry expansion. This provided more opportunity for KMI to pursue a wider range of projects: “KMI will now target minimum after-tax, unlevered project returns of 8-12% for pipelines and terminals (higher for CO2)” [Source]. 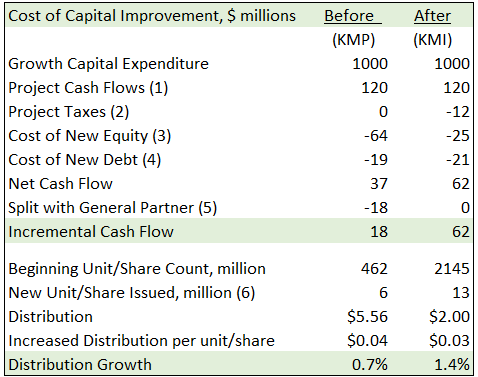 The table below is similar to one previously presented by KMI [Source] and approximates the impact of the cost of capital improvements for each $1000 million expended on new growth projects assuming 12% return on the investment. Notice the incremental cash flow increases 3.4X from $18 million to $62 million and the distributable cash flow growth 2X from 0.7% to 1.4% on the $1000 million investment. The magnitude of this reduction was a key consideration in our investment decision because it provides a second layer of confidence in the company’s guidance on increasing the distribution. The table below from KMI’s Goldman Sachs presentation shows the identified growth projects over the next five years is now about $22 billion. KMI defines their backlog as projects with secured commercial contracts or in advanced stages of negotiation. Assuming a 12% return on these projects and applying the reduced cost of capital, this five year project backlog will increase distributable cash flow by about $1.36 billion dollars annually by the end of the five years. That is about $968 million higher than the $396 million before the reduction in the cost of capital. Think of it this way; if the midstream sector builds projects at an average 12% return on invested capital and the KMI’s cost of capital to build those projects decline from 8.7% to 3.9%, the profit margin on the project increases from about 3.3% (12%-8.7%) to 8.1% (12%-3.9%)for about a 145% increase in margin. Alternatively, a lower increase in the margin can be accepted to capture more investment opportunities. Another observation is management’s distribution guidance through 2020 will require distributable cash flow to increase an additional $2.7 billion from today. The current project back log is estimated to generate a notional $1.36 billion of this. Additional discretionary investments of about $22.8 billion will also be needed. Where will these additional growth opportunities come from? Projects are constantly under development and the lower cost of capital will make more projects economically viable over the next few years. KMI’s advantage of scale enables more “tuck in” or incremental growth opportunities than competitors who may need to build out new assets where KMI foot print is already present. Incremental investment economics often show more attractive returns because they are expansions from existing facilities, with right of ways in place, and corporate support present. Companies with large footprints will likely have more opportunity for internal growth and favorable returns as existing capabilities become increasingly important. This brings us to the potential for industry consolidations through mergers and acquisitions as another source of growth. Acquisitions cannot be known in advance but we can estimate a notional value for this opportunity as well. There are about 120 other publicly traded midstream companies with a combined enterprise value (EV) of $875 billion. Add this to the $641-690 billion in estimated new investments needed, results in a $1.5 trillion industry enterprise value over the next decade. If Kinder Morgan were to just maintain its current industry EV share of about 14% ($120 billion/$875 billion) this presents an opportunity to invest or acquire an additional $90 billion EV over the next ten years or so of which $22 billion is in the project backlog. That’s about the $45 billion in discretionary investments needed over five years to meet KMI’s guidance. KMI’s as the largest participant in the sector makes it the likely consolidator and we assume it only maintains, not grow, its’ EV share of the sector. Debt can be a double edged sword, it cuts both ways. We’ve discussed the benefits of the consolidation transaction including simplifying the organization and the reduction in the cost of capital. To accomplish this though, Kinder Morgan had to invest about $40 billion in stock, $4 billion in cash, and assume $27 billion in debt. The additional debt likely raises some concern in investors’ minds about the flexibility of KMI’s balance sheet now burdened with more debt. The table below shows the status as of 6/30/15. The revolver facility utilization is relatively low (19% of available) and long term debt maturities over the next few years appears manageable. The Net debt to EBITDA credit ratio budgeted to end the year at 5.6X appears high compared to the recent five year period. Other large midstream infrastructure companies show a median debt to EBITDA ratio of about 4.0 times. 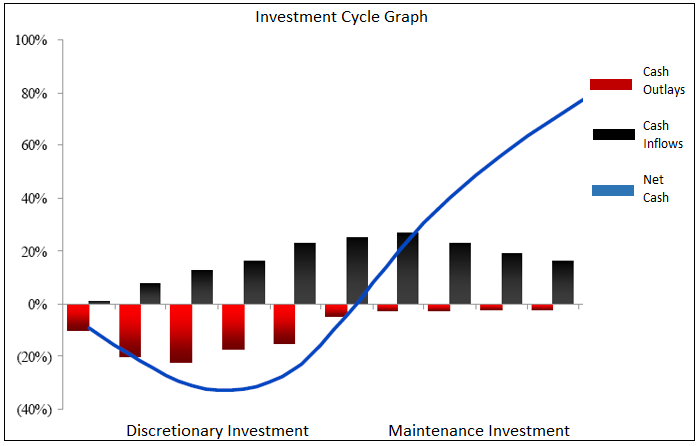 The investment cycle graph below shows conceptually how capital intensive business can cycle through the debt ratio. Cash flows often lag the heavy investment period that may take years for construction to be completed. This applies to construction of a new pipeline for example. It also applies to KMI’s consolidation where the company took on debt for the “consolidation project” and the increased cash flows from the lower cost of capital lag. As cash flows increase over the next few years the ratio should come back in line. The good news is it is almost self correcting as long as anticipated returns are achieved, but nonetheless bears watching. This is important because as the corporate credit rating increases, the purchasers of the debt are more certain of repayment and require a lower interest rate from the company. As investors we do not want the consolidation benefits that reduced the cost of equity to be offset by a higher cost of debt. In the investment thesis we implicitly assumed KMI would maintain the investment grade credit rating but that’s subject to a lot of variables. I’m not a credit expert by any stretch but the potential cost of taking on a higher leverage ratio, if manageable, when weighed against the benefits of the lower cost of capital and opportunity set seems like a no-brainer. We are in an all time record low interest rate environment and it makes sense for companies to prudently raise long term fixed rate debt to capture this low cost financing over the long term while its available. The debt must of course be sufficiently supported by stable cash flows to avoid increased risk. It is hard to know how the credit rating agencies weigh the variables to do their assessment, but there was enough confidence in KMI’s consolidation prospects to maintain the investment grade rating by the agencies. 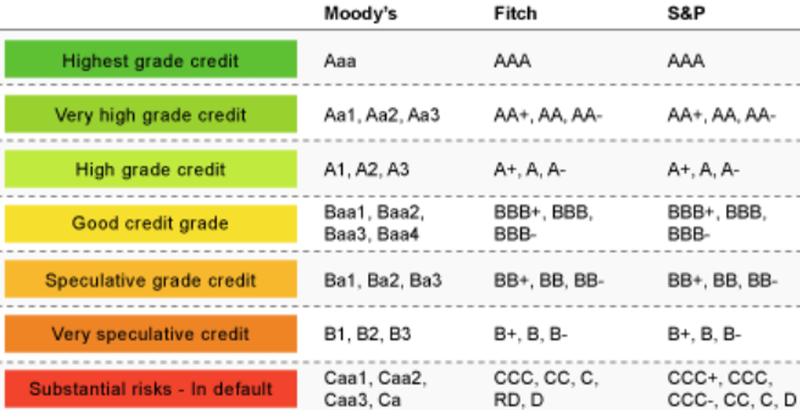 Moody’s recently announced their credit rating for KMI as of July 14, 2015 [Source] is Baa3 and “reflects its significant scale, high quality assets, and fee-based cash flows, tempered by its high leverage and payout of nearly 90% of internally generated cash flow to shareholders.” The table below shows the credit rating bears watching as well. Scale with 30% weighting. Scale measures size, diversity, property plant and equipment and EBITDA to help determine long term debt coverage. Business Risk with a 30% rating. As an example the midstream companies are viewed more favorably as they are made up of long lived assets with stable cash flows. According to Moody’s rating criteria KMI’s Property Plant and Equipment (PP&E) of $40546 MM as of the 2Q15 10Q filing and annualized six month EBITDA of $7244 MM would likely place KMI in the highest possible credit rating on scale. KMI’s highlighted ratios as of 2Q15 and where they may be ranked for these three metrics indicate less than investment grade for this category. There are two other positive factors to consider. First, recall KMI also eliminated the structural subordination. Prior to the consolidation, KMI’s subsidiary companies’ debt was structurally senior to KMI’s debt and KMI’s debt would only be repaid from subsidiary assets after the subsidiary company lenders were paid. The cross guarantees put in place for the consolidation created a single creditor class for KMI and eliminated the subordination to the benefit of creditors. Second, KMI’s lenders are familiar with the company and the investment cycle of capital intensive companies. They likely recognize this as a temporary condition further hedged by KMI’s practice of obtaining contractual commitments from customers before they build. Nonetheless, KMI’s biggest challenge, as it probably always has been, is delivering the anticipated investment returns on time to bring the financial leverage and distribution ratios back in line. There are two commonly used methods to value companies in the midstream sector: The first is a target yield to estimate the outlook over some period of time. The second method is the Dividend Discount Model (DDM) typically used to estimate the longer term valuation. Using the target yield method, the Investment Thesis in October, 2014 [Source] showed the potential for attractive 80% to 130% returns assuming a 4.2% terminal distribution yield in three to five years and 120% to 180% respectively at today’s share price of about $32.50. Using today’s higher yield of 6.2% as the terminal yield assumption, potential returns remain attractive at 55% to 100% respectively. Is our investment thesis on track? We think so. Sure, there are a lot of moving parts as the industry is in continual flux and subject to more changes. But this has always been the case, and it is management’s job to manage these changes and allocate capital in a manner most beneficial to shareholders. KMI is run by proven and shareholder friendly management; with $8+ billion of their own money invested alongside of us and supported by a record of proven performance. Perhaps it is the company’s record of delivering on promises and management’s aligned interest with shareholders that we take a lot of comfort in. Since 2000 the company has delivered or exceeded their distribution targets in 13 out of 14 years and the only year they did miss, it was by $.02 or within 99%, delivering $3.26 instead of $3.28 for the year. Ten months further into the energy cycle downturn, management still affirms the guidance used in our investment thesis. The underlying business and KMI’s numbers support the investment. Keep in mind the large footprint of hard to duplicate infrastructure assets already in place, a wide protective moat, 87% stable cash flows, and a near-monopoly status. The is industry facing unprecedented growth; with relatively inelastic demand for its essential services; and KMI’s scale and significantly lower cost of capital increases the opportunity. There are three general conditions that create bargains for value investors: 1) a market turndown; 2) an industry sector downturn and, 3) an individual stocks that is temporarily out of favor for some reason. We may have all three at play with KMI at this time. Until and unless we learn differently, the rest is just noise. I’d like to know how you react to the dividend cut and Buffett recently buying. I wonder how we can believe this management anymore. Promises were broken. Of course they had no choice at that point, but they do had a choice before getting there, right? Thank you for your comment. The “Silver Lining” post on KMI and probably answered most of what you are asked except how can believe management? My take is they, like many others, did not anticipate the magnitude of the share price decline with the sector downturn. That made equity to expensive to issue, and also limited borrowing indirectly without equity to help keep leverage in line. The only other place to get funding was from the internal cash flow stream or asset sales in a bad market. I agree they didn’t have much choice other than cut the dividend or forego good projects and/or keep the leverage high for an extended period. A no win for all stakeholders. I believe they will act in the best interest of shareholders to the extent its in their control because they too are shareholders with their interests are aligned with ours. Unfortunately they will make misjudge things at times.